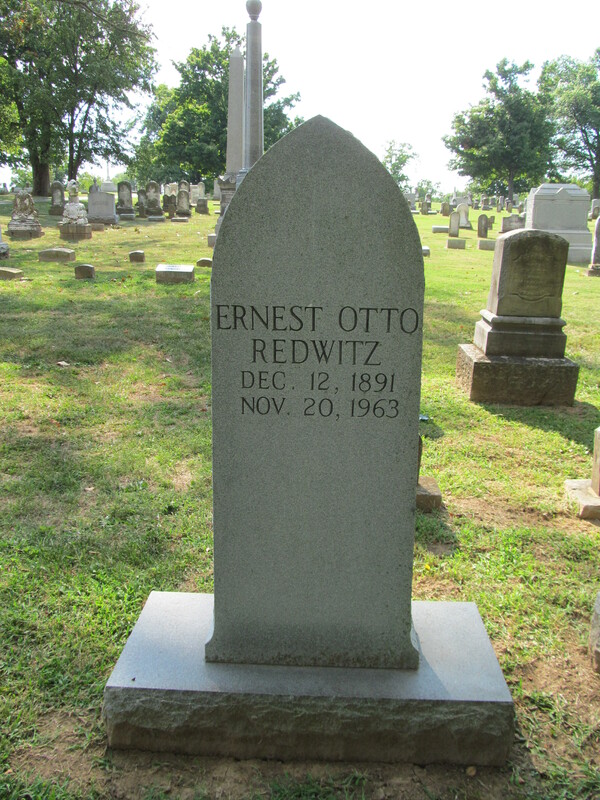 Tuesday morning shortly after eleven o’clock Mr. Otto Redwitz, one of the oldest and best known business men of this place, and in whose veins coursed royal blood, died at his home on Main Street, after an illness of two weeks of grip. The funeral took place Wednesday afternoon at three o’clock at the Baptist church, Rev. W.M. Wood, the pastor, officiating. He was a devoted and loyal member of Montgomery Lodge, and was buried in Spring Hill with all the honors of Odd Fellowship. Mr. Redwitz was a native of Stuggart, Germany, and came to this country many years ago, crossing the ocean in the same ship that brought over the famous Carl Schurtz, who was fleeing to America after having failed in his efforts to stir up a revolution in his native country. He shortly came to Harrodsburg and embarked in the confectionery business in which he had been engaged ever since. That was forty-six years ago, and there is not a merchant here now who was in business at the time Mr. Redwitz opened his first establishment. During his long residence among us he has gained nothing but the highest respect from the whole community, being in all things a representative citizen and an exemplary man. He was upright and honest in his business dealings, and at one time was counted wealthy. He was married in New York when quite young, his wife, who is very ill now, still surviving him. Beside his wife he leaves two sons, Messrs. Alec and Paul Redwitz, and several daughters. He was 72 years of age, and for some time had been in failing health. Of the many good citizens who have passed away in the last few months, none will be missed more from the business world than Mr. Redwitz. Mrs. Otto Redwitz, a former well known resident of this city, died in Cincinnati yesterday. She was the wife of Mr. Otto Redwitz, who was for many years a prominent merchant of this city. The remains were brought here and brief funeral services will be held to-day (Friday) at the grave in Spring Hill Cemetery at 11:30 o’clock. She was a native of Germany and a very fine old gentlewoman, who will be remembered by the older citizens. There are no gravestones for Mr. and Mrs. Redwitz. 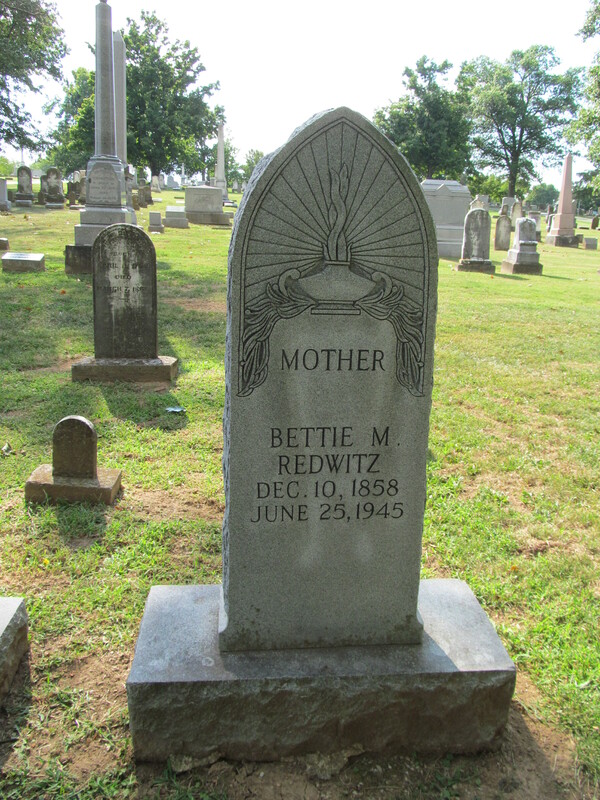 Bettie M. Redwitz, December 10, 1858 – June 25, 1945. Spring Hill Cemetery, Mercer County, Kentucky. Mrs. Bettie Redwitz, 87, died about 9 a.m. Saturday, June 23, 1945, at the A. D. Price Memorial Hospital following an illness of about 10 days. Owing to her years she has been declining in health, but continued her daily pursuits, active in mind and body for one of her age. She was a native of this place, the daughter of Gabe and Nancy Shy Munday, and a devoted member of the Baptist church, taking part in its activities as long as her health permitted. Mrs. Redwitz was among the most esteemed of the older generation. Survivors include a son, E. Otto Redwitz, Harrodsburg; a daughter, Mrs. Ruby Redwitz Owen, wife of J. E. Owen, Dothan, Ala.; two grandchildren, Mrs. C. C. Jones, of Dothan, and Lt. Thomas O. Owen, Williams Field, Arizona. The funeral was at 3:30 Monday, June 25, at the Bruner and Sims Funeral Home on Beaumont Avenue, conducted by the pastor, Dr. John M. Carter, of the Harrodsburg Baptist church. Burial in Spring Hill cemetery, the bearers being Loyd Bigger, Glave Vivion, W. B. Morris, Fred Patrick, Oran Stagg and H. R. Barrick. Bettie was the wife of Alec O. Redwitz, son of the above Mr. and Mrs. Otto Redwitz. Ernest Otto Redwitz, December 12, 1891 – November 20, 1963. Son of Alec and Bettie Redwitz.